← 203 "Natural Born Kissers"
The family attempts to sit on the couch, but it moves backwards and they fall to the floor. Nelson, pointing his finger at the family, says, "Haw haw!" "Lard of the Dance" is the first episode of season 10. It originally aired on August 23, 1998. The episode was written by Jane O'Brien and directed by Dominic Polcino. Lisa Kudrow guest stars as Alex Whitney. "Homer and Bart team up to dip their hands in the grease recycling business. Meanwhile, Lisa is chosen to introduce a new student to Springfield Elementary, one who's years ahead of her age." After going back-to-school shopping, Homer learns from Apu that he can sell grease to make a profit. At breakfast, Homer begins frying up various amounts of bacon to use the grease to make money, then decides to hire Bart for his "grease business" (ultimately forcing Bart to quit school). 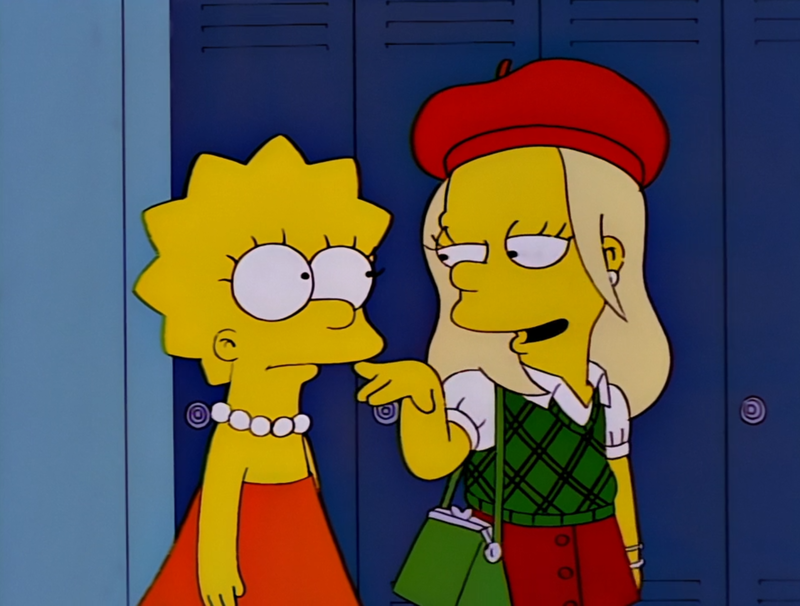 Meanwhile, on the first day back at school, Lisa volunteers to help Alex Whitney, a fashion conscious new student, by showing her around the school. To help her make new friends, Lisa takes Alex to meet Sherri, Terri, Allison Taylor and Janey for lunch in the cafeteria, but then the girls quickly abandon Lisa after rapidly becoming best friends with the newcomer. Homer and Bart begin their grease business and make sixty-three cents worth of grease from twenty-seven dollars worth of bacon, much to their disappointment. The two continue their grease business, resuming to drive past Springfield Elementary School where Bart gazes at his former schoolmates playing. The pair drive to Krusty Burger, where they steal grease from the fryers (and consider taking some from the face of the Squeaky-voiced teen working there), but the grease Homer and Bart stole (and quite literally placed in the back of the car, causing Bart to tell Homer that Marge will most likely kill Homer if she ever found out that he not only stole grease, but was also dumping it in the back of the truck) is later taken by The Springfield grease and shovel company, who attempt to warn them off. Alex convinces Principal Skinner to put on a school dance rather than the other event he had organised. Skinner agrees, so Alex and Lisa, accompanied by Sherri, Terri, Janey and Allison visit the mall to purchase party supplies. The girls soon take a detour and begin trying on outfits for the dance, despite Lisa's protests and Alex attempting to convince her it will help her get a date for the dance. The group leave the mall, none speaking to each other. Lisa wears the gothic outfit she bought at the mall, but the boys and not impressed and she finds it uncomfortable. She decides not to attend the dance, but changes her mind and goes to the school to take tickets at the door. She later enters the hall and discovers the boys and girls on opposite sides of the room, afraid to approach each other. Alex doesn't understand why: Lisa explains to her it is like this because they're only children, not adults. Bart reveals to Homer that the school kitchen will have an enormous amount of grease - They arrive at the school during the dance to steal it. Homer sneaks into the kitchen and plants a hose in the fryer, sucking the grease into the car, but Groundskeeper Willie spots them and attempts to stop them, claiming that the grease is for his retirement. A fight ensues between the two of them after a brief argument regarding Willie's nationality. Homer tries to escape, but Willie grabs his legs and strangles him with the hose sucking the grease. Due to increased pressure the hose explodes, causing grease to fall out of the ventilation shaft into the hall where the dance is being held. A faux-snowball fight using the grease breaks out among the students, and Alex eventually joins in after being told by Lisa to act her own age. Modified on July 9, 2017, at 01:33.